Home | A Miracle Every Day | Miracles | You have been chosen! Together, let’s fix our eyes on the greatest blessing in the Christian life: eternal life! Heaven is a reality, and God waits for you there! Have you ever tried to imagine God’s greatness? Our understanding of the universe and its Creator is often limited to what our eyes can observe or study. Some books compare the size of the Earth and sun by placing them side by side. While the sun looks like a round, brilliant yellow structure, much too large to be depicted in its entirety, the Earth appears to take up the space of a pinhead. 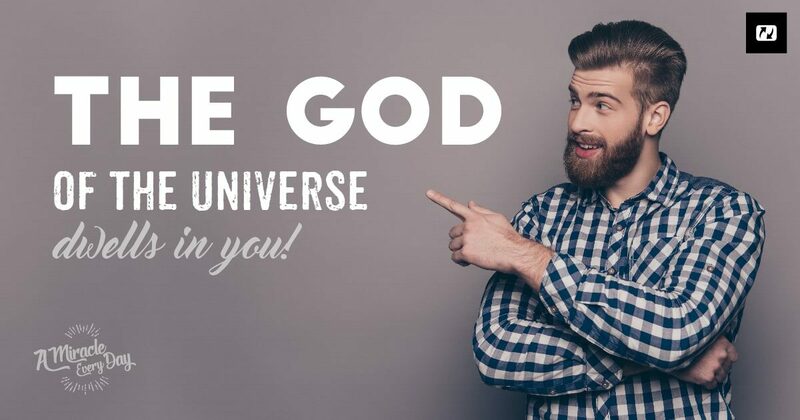 Do you perhaps think that it’s impossible that this infinitely great and powerful God could live in you? Because you sometimes feel unworthy of Him and so small that you don’t understand that He could’ve chosen to reside in you? Know that there are no physical boundaries between heaven and Earth…nor between you and God. From the moment you give Him your whole life, He occupies all the space…in your heart too. He is eternally with you, in you. Don’t ever doubt it! Today, I encourage you to realize, every day, that the God of the universe who established His throne in heaven also dwells in you. May your day be filled with the happiness of being with the God of heaven and Earth! Want to move in the supernatural. Eric , your messages are always unique and so carefully written. God bless and anoint you and your ministry for Him that it continues to transform lives and bring the reader closer to Almighty God in Jesus’ name. Amen.